Dozens of civilians killed in Gaza: Palestinians reported Tuesday that dozens of people have been killed since the afternoon hours in three separate Israel Defense Force strikes on civilian targets. Sources in the Strip reported that at least 40 civilians were killed in an attack near a United Nations Relief and Works Agency for Palestine Refugees (UNWRA) school in northern Gaza. 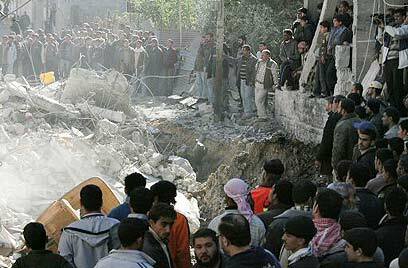 A UN spokesman said 30 Palestinians were killed in the strike. Palestinian sources reported that several shells hit the UN's al-Fahoura school. The school housed Palestinians forced to leave their homes which are located near the border fence for fear for their lives. The residents were living in the school's classrooms and corridors. The shelter turned into a fire zone when several shells hit the school, killing at least 40 people, including many women and children. Palestinians reported that the number of casualties may rise as many people were critically hurt and the rescue teams had yet to reach all of the injured. This was second UNWRA school hit Tuesday. At least three civilians were killed in an IDF strike on another school housing residents who fled their homes for fear for their lives. Earlier, Palestinians reported that 13 people, including nine members of one family, were killed as a house in the Zeitoun neighborhood sustained a direct hit. Among the dead were six children aged one to 12. Some 40 people were living in the four-story structure, and all gathered in the ground floor for fear of a shell hitting the upper floors. A missile fired by a warplane caused the building to collapse. Rescue teams searched for bodies and survivors under the rubble for hours. Palestinians reported that the rescue teams were shot at several times as they attempted to evacuate the injured. New agencies released difficult images from the scene of the incident, showing children buried under the rubble. The Israel Defense Forces has yet to respond to the Palestinian reports. A spokesman for Hamas' military wing said that the IDF was targeting civilians due to its pressure and distress following its failure to reach the Palestinian gunmen. Some 610 Palestinians have been killed in Gaza since the start of Operation Cast Lead. Palestinians claim that 290 of the dead were women and children. United Nations humanitarian chief John Holmes told reporters in New York on Monday that UN officials believe at least 500 Palestinians have been killed since the IDF launched Operation Cast Lead in Gaza and that as many as 25% are civilians. See all talkbacks "Report: Dozens dead in IDF strikes"